Looking back over the years since I’ve had my first baby, there have been countless lessons learned, wisdom gained, and knowledge acquired–and I’m still learning. There have so many times I’ve muttered to myself “I wish I knew that the first time!”, and with some things, wondered why in the world no one ever filled me in beforehand! So…I’m going to do that for you. Six babies later, I’m sharing not only some of the truths I’ve learned, but also tips on some baby basics and advice for new moms, and maybe–hopefully– you’ll glean a little something that will help you on your motherhood journey. And while you’re in the thick of it, you’ll know that someone else has been there, and understands. You ready? 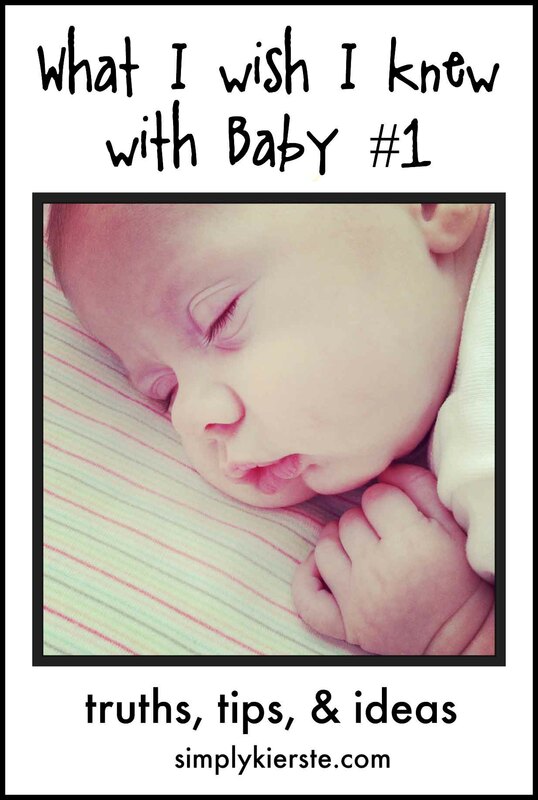 Here we go…what I wish I knew with baby #1! You will still look pregnant after you have your baby. Like 4-5 months pregnant. At least. Unless you are a freak of nature (and I still love you if that’s you–just extremely jealous), you will probably wear your maternity jeans for a month or two after your baby is born, and at the very least, lots of very stretchy and comfy yoga pants. This came as a big shock to me. I had no idea that that’s how it worked, and I squeezed into the pants I brought to the hospital to wear home. So, just be prepared. That’s half the battle, right? Bring your comfiest, stretchiest pants with a waistband that won’t hurt you (especially if you have a c-section, like I did several times). Your stomach will go down over the next weeks, but it takes time. Just remember—you are a ROCK STAR. You just grew and gave birth to a tiny human, and you’ve earned your stripes, and that stomach. You are beautiful, and even though you don’t feel it, tell yourself in the mirror at least ten times a day how awesome you are. If you forget, I will remind you. As a new mom, you might be wondering if you have the “mom instincts” to know what to do, and how to do it. If they just “come”, or if they happen over time. Actually, it’s a little of both. You’re the mom, it’s your baby, and with that comes an innate sense of what “feels right”, and what doesn’t. Listen to it. Trust it. Don’t be afraid to act on it. When my oldest was just two weeks old, his umbilical cord was just not looking right. The whole surrounding belly button area was red and a little inflamed, and even though I had no idea what it was actually supposed to look like, I had a feeling that something wasn’t quite right. He was also so fussy, I couldn’t get him calmed down, and I decided to take him into the doctor to get it checked out. I was nervous about it, because I didn’t want the doctor to think I was crazy. If nothing was wrong, I would like really foolish, and it would suddenly be very obvious that I had no idea what I was doing. In the end, I decided I would much rather go in and look a little silly, then not go in and be worried sick, or have something be really wrong. When I got to the office, it took only about five minutes before they sent him directly to the PICU of the nearest children’s hospital–we skipped the emergency room, everything. He had a very serious bacterial infection that required a week in the PICU, a PICC line inserted and another week at home on heavy antibiotics. The doctors kept asking me over and over again how I knew, how just a little redness around the belly button clued me in, but I didn’t really have an answer other than I just knew. I didn’t know what was wrong, or that would be that serious, but I’m so glad I trusted those instincts. That has proved to be the case over and over again, with all of my children, in every situation, both small and large. Despite popular opinion and what you may see on social media, there is more than one way to do things. There is usually not a right or wrong when it comes to parenting, even though you might be told that on more than one occasion. I remember having little old ladies stop me in the grocery store, and lecture me on the fact that my baby MUST be freezing because he only had one pair of socks, one jacket and his ears weren’t properly covered. (And this was when it was 80 degrees outside.) These days it’s morphed into things like breastfeeding vs. bottle-feeding, co-sleeping or not, working or staying at home, and a million other hot topics. Don’t listen to it. Make your own, informed choices and be confident in them. You know best what your baby and your family needs, when you are really honest with yourself and do the research. I was devastated that I wasn’t able to breastfeed when I had my first baby, and that first week was perhaps the most anguished I’ve ever been, as we were both absolutely miserable, and he was starving. Finally, after trying so many things, and after getting a lecture from a professional that brought me to tears for the millionth time that day, I called my mom. She gave me the “permission” to just let go–to realize that my body wasn’t going to cooperate with what I wanted, and that it was OKAY. I was okay. The baby would be okay. I wasn’t any less of a mother because I bottle fed my baby. I have held firm to that conversation over the years, and applied it to so many different situations. I get to decide what’s right for me, and that makes it right! In the same token, be supportive to all the moms around you, even if your choices are different. They get to decide what’s right for them too! When we stick together, we are SO much stronger. One of my least favorite things (okay, my least favorite thing) about social media is how much criticizing there is of other moms and women. If you don’t agree, that’s fine, but don’t tear someone else down. Yes, you definitely want to trust your instincts and make your own decisions, but asking for help and advice when you need it is also an important part of being a first time mother, and I’m still doing it now! I love to talk to other moms that have already been where I’ve been, find out what worked for them, what didn’t and why, so I can learn from it. It was invaluable to me especially when that first baby was born, and I couldn’t get enough information from the people around me. Take advantage of others’ experience and wisdom. Relish that newborn stage–it’s over in the blink of an eye. I know, I know, you’ve heard this a million times, but there is a reason you have. It’s true! That squishy, cuddly, pull-the-knees-up-to-your-chest phase only lasts a matter of a few weeks, and soon you’ll go from newborn to baby. Let the dishes sit. Hold your baby. Soak up every last minute of it, because it will be over before you know it. I realize that’s sometimes easier said than done, because you’re most likely not getting any sleep, and you’re still recovering from having your baby. But make it a conscious effort, and you’ll never regret it. Oh, this is so much easier said than done! When you’re already feeling overwhelmed and tired and actually exhausted and already behind in every other aspect of your life, plus a spouse and possibly other children to take care of, it’s hard to even imagine being able to carve out a spare minute for yourself. But it’s important. Really important. Vital, I would actually say. When you haven’t taken care of yourself, you won’t have anything to give to others. Whether it’s a bubble bath, pedicure, taking thirty minutes to read a favorite book, meditation, or whatever it is that you love, make the time to do it. You will be a better, more relaxed, happy mama! You are a mom! It is an incomparable joy—nothing comes close to the love you feel for your baby. I know that even though you love your baby so much, it’s hard. Really hard. Recovering from birth and perhaps surgery (I’ve had three c-sections + vaginal birth) is uncomfortable, and very likely painful. You’re tired, aren’t getting enough sleep, and are learning to adjust to whole new way of life. I totally get it. But you CAN do it. Lean on your spouse, parents, friends, and all the others in your life that love you, because they’ll want to be there for you. Let them. Know that you are strong, you’ve got a beautiful baby, and things will get even better. You will heal, the baby will start sleeping for longer and longer periods of time at night, and you will gradually adjust to your new normal. Here are just a few of the things I have discovered with my kids…in case you want to give one a try! Give them a bottle, even if they’re breastfeeding. As an almost exclusive bottle feeder, I always used the Playtex Nursers with either the drop in liners or regular liners. It’s my favorite for lots of reasons, but I love that you can just throw away the liners–there is no bottle washing (trying to get milk out of corners made me crazy). At bedtime, once they are fed and changed and they’re not sick–it’s okay to let them cry. I’ll admit, I HATE to hear my babies cry. But I did learn that once all of their needs were taken care of, and they were comfortable, and I had sung and rocked and patted–they had the ability to put themselves to sleep. I set a time limit, and if they didn’t stop crying by then, I would go in and pat them and sing to them and get them calmed down. They did all learn to go to sleep easily, and on their own, and having good sleepers was one of the best things that could have happened to me! It’s so much easier to take away a pacifier, than a thumb! My kids all took pacifiers except the last one, and how I wish she would have! We take them away around 18 months, or when they start talking, and it’s always worked for us. The pacifier of choice at our house? The Avent Soothie. It’s just like the ones at the hospital (at least all of the hospitals my babies were born in), and my babes all loved them. The fire station or police station will put in your carseat for you and teach you how to do it correctly. If you worry about not putting in your carseat correctly (and actually, a lot of people do not have them installed properly), you can contact your local fire station or police station to get al the specific of where you need to go. They have someone trained to put it in the right way, and show you how to do it. You can go in more than once–anytime you need it! I’ve been in on multiple occasions, and whenever we get a new vehicle. Carseat safety is huge for me–it’s one thing I don’t want to take any chances with. Make sure you watch, learn, and ask plenty of questions, so you’ll be able to do it properly on your own. You will have to take it in and out, so it’s key to know what to do. My favorite carseat is this one by Chicco! When my babies were tiny, I used the Stroller Caddy, and the carseat just clicked right in to the frame. It folds up pretty flat, and fit easily in my vehicle. When they hit 6-8 months, I transferred them over to the regular stroller. I don’t use regular sippy cups anymore. Well, hardly ever anyway. I love disposable ones because they’re cheap, and if they get lost or ruined, you don’t have to worry as much! If there is one thing that I can swear by, it’s a baby carrier. I cannot tell you how much I love it! Whether you prefer a sling, wrap, or baby carrier, having a way to carry your baby and be hands free is worth its weight in gold. Find one you like!! It helps you get chores done around the house. lets you go grocery shopping more easily, and also do other activities where taking a stroller is difficult or impossible. It’s one of my number one baby items! If you have more children, it’s so helpful when you’re trying to watch a toddler, and hold a baby at the same time. My absolute favorite is the Boba Baby Carrier. It can hold up to 48 pounds–up to 3 or 4 years old–and it’s SO comfy! I’ve used other brands, and my hips and back just ache after a little while. I’ve worn this all day and not been bothered by it at all. I’m also not a huge fan of carrying babies forward facing, and this one can be worn in front with their small, and on your back when they’re older. We use it ALL the time. Love love love it! When they get old enough to sit up, try putting a plastic laundry basket in the bathtub to bathe them in. Slippery babies can be tricky to hold on to and bathe at the same time, and this confines them just a little bit more. The basket has holes in it for draining, and it’s easy to rinse or wash as necessary. A Laundry Routine that Works for EVERY Size Family! 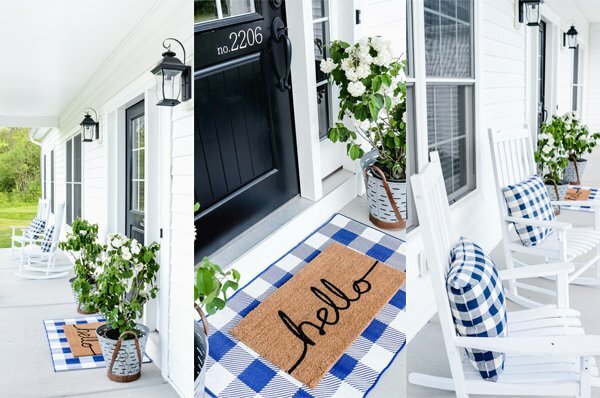 CLICK HERE TO JOIN MY NEWSLETTER…GET THE LATEST FARMHOUSE STYLE, DIY, AND MORE IN YOUR INBOX AND DON’T MISS A THING!! While I was in the hospital after having our first baby, my husband took our car seat to our local fire station, and they told him they couldn’t help him, nor could they direct him to someplace that could help him install it properly. He was so livid! He eventually figured out how to install it himself. So, first, don’t wait until it’s time to bring the baby home to install the car seat, and second, check around before you assume the local fire station can help you. Regarding bottle feeding breastfed babies. My lactation consultant and pediatrician both told me to wait until the baby was 4 weeks old before offering a bottle to make sure that breastfeeding is established well. Then if you want the baby to continue to take a bottle they should be given at least one a week. My first baby loved the soothie pacifiers and the bottles that came with my breast pump. My second baby we had to try 5 different pacifiers and 4 different bottles to find one he would take. It may take some work and babies definitely have their own preferences. I am 11 weeks pregnant and already have everyones opinion flying at me! This is my first one. So I am a bit overwhelmed. I saw your blog on Pinterest. Thank you so much for being so honest. It made me feel so much better about being a mom and doing things my own way. I have always been an independent person and its super hard when people think they should have a say on your pregnancy and your kids. Even books I have read make things so difficult and one sided. This helped clear a lot off my chest and mind! We need a lot more mothers and women like you. We just need to support each other instead of being against each other. This gave me a piece of mind thank you! This is just what I needed to hear! My 8 month old is going thru the 8 month sleep regression. While it could be a lot worse, ithe sleep deprivation has been JUST hard enough for me to give up on our previous sleep training success and now we co-sleep (which is something I told myself I’d never do!!). My advice to new mommies: be flexible!! ? This is so interesting! My older sister is (so far) the only one in the family who has children, and she is very adamant about breastfeeding ONLY. I have a lot of respect for her and I believe she is one of the most informed people about babies I know, but something has always rung a little off when I thought about how little down-time that leaves the mother….my fiance and I joke about his sleep schedule – he is a TRUE night owl by nature, and the other day I said “That’s fine! You can play video games all night as long as you take the night time feeding shifts!” Realizing this went against the opinion of the only person with baby experience I know, I wasn’t sure how I felt about it. I really want my fiance to have that bonding experience with the baby, and honestly I don’t see the harm in bottle feeding if you are also breast feeding, and giving mother’s milk. The other aspects of this article are also great! Love the laundry basket in the tub idea! I will be sure to save this page and pull it out when I am finally expecting! Thanks! Thanks so much for stopping by, and for commenting! Have a fabulous day!! Thank you so much for the suggestion of the Boba baby carrier. I had been expecting to fork out for an expensive carrier and separate newborn insert. But the Boba fits what I want for a much better price – suitable from newborn toddler , wide leg position and suitable for front and back use. About to order one right now! Love these tips! I’m on baby #2 here. My first baby was easier to teach to fall asleep on his own. My little girl has been a much fussier baby, so we’ve used any tricks to get her to sleep. Now that we’ve adjusted some, I’m ready for more structure. About what age did you start allowing them to figure out how to fall asleep on their own? I know all babies are different and all momma hearts are different.